Need help on how to plan a kids party? We’ve put together a list of fun kids birthday party ideas and themes you can use for your child's special day. We know that a kid’s birthday party can be challenging (any roomful of kids can be a handful) so while we have some memorable kid’s theme parties here we kept the parties as simple as possible to make your life a little easier. We even have a perfect kids party that works for any theme. Browse through our ideas for girls, boys or first pages or keep reading for ideas that will work for any child's birthday party. Picking a theme for a girl’s party is fun and easy since there are so many options. Matching paper goods and party supplies are available which makes decorating, and setting the table much easier. Your child probably has a favorites cartoon character, princess or super hero. Go with that! Talk to your child and see what they would like! You may be surprised at all their great ideas. Parties for young children, under the age of 5 should be kept to an hour and a half. For older kids, 2 hours is just fine. You may not want to open presents at the party. It's hard for kids to watch someone else get all the loot! Your party invitation is the first hint people get about the party you will be hosting. I like to match my invitations to the theme of the party we are hosting. It's easy to find themed invitations. All of our birthday party themes have matching fill in the blank invitations. Easy as can be! Party411 has wonderful invitations for kid's birthdays that can be customized for the big day! How about a great photo invitation? Try a photo ticket invitation to invite everyone to a movie theme party for your guy or a princess castle invitation for your princess. Here are a few of our most popular designs... many of the photos on the samples are kids of Party411 event planners! We also have a great selection of personalized birthday invitations. There is a wide selection of theme invitations as well as fun birthday theme invites to choose from. Birthday party decorations are so much fun! Start with bright colorful balloons and crepe paper and add pizazz to any space! Don't forget to mix in themed paper goods and decorations if you're having a theme party. Personalized Banner - welcome everyone with a banner personalized for your party! You can hang it outside to let everyone know where the party is, or hang it inside for a perfect wall decorations. Add your own wording, and many designs even let you include a picture. Balloons- A party staple! Make balloon bouquets from latex balloons in colors that coordinate with your theme. Add a Mylar balloon that matches the theme to each bunch if one is available. Always use an odd number of balloons to make the best looking bouquets. Don't forget the coordinating curling ribbon and the helium tank! Justin, my youngest, was born on St. Patrick's Day. For his first birthday we did a St. Patrick's Day theme, and I posted a few pictures on the Party411 blog. The one decoration everyone just loved was a cutout of Justin as a leprechaun. We do our life-sized cutouts in a table top size as well, and it is a great party decoration. Julie just used one for Jack's birthday (sports theme) near the favor table to remind the kid's to grab their favor bags. See all of our custom cutouts for all of the fun themes available! Set the table with paper goods that match your theme. Most styles have everything matching, from plates, to cups to tablecloths. Personally, I like to do one patterned plate, with coordinating solid color paper goods and a plain colored table cloth. I think it looks less busy, but it depends on your pattern... so it's up to you. Silverware can be set on napkins next to the plates, or they can be wrapped in silverware bundles by rolling the silverware up in the napkin, and tying it closed with ribbon, or a party favor. For instance, for a sports theme party you could use a whistle, for a candy theme you can use a candy necklace. It's a great way to display a favor on the table. Depending on the party favor I choose, sometimes I like to place them at the kids seats. Hats and other wearables can be enjoyed throughout the party, so I like the kids to get their hands on them early. T-shirts can be placed on the backs of chairs. Another cute favor for the table are personalized water bottles, which are especially good for parties where the kids will be running around (bounce houses, play centers). 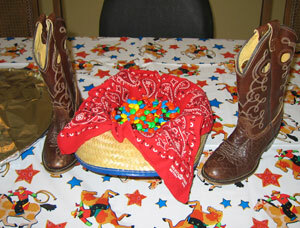 Place snacks in bowls in the middle of the table, and sprinkle confetti or wrapped candies across the table top. If the room is large, I recommend doing balloon bouquets on the table add color. Get creative with your balloon weights. The foil ones are ok, but something to match your theme is even better. Jungle bean bag animals for a safari theme, silver painted "moon rocks" for an outer space theme, bunches of bananas for a monkey theme... get creative! Your theme and location are key to choosing activities for a birthday party. If you choose a place that will entertain the kids, like a bounce house party place or an indoor playground facility you won't need to do anything for activities other than arrive ready to play. This makes the planning simple! Mail the invites, bring a cake and favors and you're done! For a party at home or a party center, choose a fun activity the kids will love. Face Painting - This is a great activity that kids love. You can paint on their cheek or hand. Have a teenager or another adult paint so you can be available to run the rest of the party. Cookie Decorating - Always fun and tasty... dessert and activity in one. Before the party, bake sugar cookies and let them cool. 2-3 cookies per child is a good rule of thumb (one to eat, some to take home... and now you have a favor too!) If you have a theme, use a cookie cutter in a coordinating shape, like a rocket for a space theme party. Provide while icing and sprinkles, and a take home container (or a custom party favor bag) with a little note "Friends are the sprinkles on the cookie of life... thanks for celebrating Billy's birthday with him!" Bring in an Entertainer - Julie, one of the event planners here at Party411, threw a Jungle theme party for her son Jack a few years ago. She had a local wildlife expert "Jungle Terry" bring in some of his animals for the kids to experience. You can see some of the pictures on our blog. See if there is anyone in you area to do a similar show and tell. Scavenger hunt - Perfect for an explorer party or any kids party. Let the birthday girl or boy help create a map for her friends to find prizes. A candy hunt is also great for a Candyland party. Arts and crafts - Having a craft area is great fun for any party. Try merging an activity and a theme all in one. For example, the left photo below is from a candy theme party. Set up a jelly bean recipe center or a candy buffet. (Don't forget goodie bags) The kids will have a blast with this activity! Or how about face painting for a princess party or a Fancy Nancy party? What fun! We have more ideas over at our kid's birthday party games page too. Personalized lollipops - kids LOVE candy and a giant lollipop personalized from a friend's party can't be beat! Candy and snacks - I always add in themed candy or snacks to our goodie bags. Princess fruit snacks or Minnie Mouse Pez. Of course, I love personalized party supplies. I make sure all the favors we create go home in a special personalized bag. I'm so excited that Party411.com now has personalized favor bags with many designs matching our favorite themes. A little bit of candy, some stickers and other assorted goodies and you're all set. It’s also fun to use something that fits your theme. For example if you are doing Finding Nemo, or are having a beach party, use some plastic beach pails as your “bag”. The favors will serve as a sweet reminder of a fantastic party. Have a perfect time at your child's birthday party. No matter what, have a great time planning a very special day for a very special kid!